Author’s note: I only chose items for this list based on them starting in 2011, which is the main reason why Breaking Bad and Louie are not on this list. They should have their own articles. I felt both 50/50 and Win Win deserved some hype, so here it is. Win Win was the first movie of the year that really deserved any award talk when it came out in March, but time was not on its side as it was forgotten about pretty quickly. The acting performances blew me away in Win Win. Paul Giamatti, who is pretty much the indie movie older guy kind along with Phillip Seymour Hoffman, did a great job as usual. The real performance is with Alex Shaffer, who had never acted before this movie and was given the part because he was an actual state wrestling champion. 50/50 was the only movie this year that had me both smiling and in tears at the same time, a distinction that Toy Story 3 held last year and that The Muppets came close to matching. At this point, I truly believe that there is no topic that can be made funny while still being respectful. I was late on the Death Cab bandwagon. They had been making sad songs years before they became my favorite band. And while this album was definitely the happiest album to date (RIP Ben and Zooey), it still had the greatest of all their previous work. The perfect mix of rock out, dancey, and sentimental, Codes and Keys continues Death Cab’s legacy. The Muppets had everything in a movie that I could ever want, and you can read about all of that here. While I’m a fan of UConn basketball and will talk them up normally, what they did in March of this year was truly amazing. After losing their final two games of the regular season and putting themselves in a position to be a middle seed in the NCAA tournament, the UConn Huskies went on to win 11 games in under a month. Even crazier, each one of those games was an elimination game, and while the first 5 would have just knocked them out of the Big East tournament, they wouldn’t have had such a good seed in the NCAA tournament had they not won those games. They ended up winning both of those tournaments. I’m fairly certain I won’t see anything that insane happen to one of my favorite teams in sports again. I knew I was going to love this movie when I saw the credits for it: Co-Written by Kristen Wiig, Staring Kristen Wiig, Produced by Judd Apatow, and Directed by Paul Feig (who really can do no wrong). They did not disappoint me in any way. Midnight in Paris was another movie that was stuck with a trailer that did not do a good job of saying what the movie was. Luckily I went and saw it anyway, and ended up having an awesome time for 90 minutes. There’s just something about the past that people love to be a part of. Hugo was another movie set in Paris that took advantage of the past. This movie took the approach of the cinematic past (I’m sensing a theme this year with The Artist doing the same thing). If you’re a cinefile and enjoy Paris you should definitely check out Hugo. Every once in a while a comedy comes along that screws up my rankings of my top 5 comedies of all time. Sometimes they are a juggernaut, like The Office. Other times they slip under the radar, like Party Down. Happy Endings slipped under the radar so much that after its first season aired in March, most of the actors were on pilots for other shows for the follow fall (most notably Damon Wayans Jr., who ended up having to leave New Girl when Happy Endings was picked up for a 2nd season). I’m so glad it’s back, because Happy Endings takes the core of Friends and combines the absurdity and vocabulary of Seinfeld to create an awesome half hour. Before this album was released, I had to have a heart to heart with myself. I had to accept that nothing was going to be as raw sounding and heartbreaking as For Emma, Forever Ago, Bon Iver’s first LP. I’m glad that I did, because Bon Iver was very different sounding in terms of music, but kept its core sound with Justin Vernon’s beautiful falsetto. The result is pretty brilliant. I wanted to put just Ryan Gosling on this list, but I realized that even though Crazy, Stupid, Love deserved a shout out, Drive deserves eighty. Although the trailer advertised it as a mix between Fast and the Furious and The Transporter, Drive is much smarter (and to be honest, much slower) than either of those movies. Ryan Gosling only says a handful of words in the first half of the movie, and his character doesn’t even have a name. However, don’t let that fool you; Drive has its fair share of action and probably more blood than you need, but it is without a doubt the best movie I’ve seen this year and it makes me mad it’s not getting more Oscar buzz. While I first starting watching Homeland as something to do after Dexter, my opinions quickly shifted after 2 or 3 episodes. By mid-season, I was more excited for Homeland than I was for Dexter. It juggles story incredibly well and has amazing acting performances by Claire Danes and Damian Lewis. The creators of 24 have definitely upped their game and are no longer restricted to a 24-hour storyline, which lets a lot more storylines intensify and play out. If you’re not watching, you are missing out on the best show on TV right now (barely inching out Breaking Bad). There are very few shows I actually get excited to watch these days. There are just so many shows I follow that it becomes a task. I’ll watch why doing work on my computer just because there’s simply not enough time in the day. With Shameless though, I sit with no distractions and actually enjoy the show. I’m invested in the characters, I laugh, and I want to hang out with the Gallagers. Although it’s a genre-neutral show and can’t really be compared to big dramas out there, it easily holds its own amongst top shows. 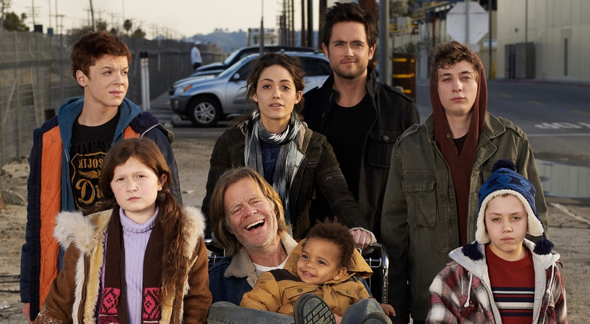 While its concept may be hard to sell, everyone I know who has watched Shameless has loved it.